There are several hang gliding clubs and one paragliding club in the San Francisco Bay Area. Their primary function is social (meetings, club trips, parties, etc.). They are also responsible for regulating and managing many flying sites in the Bay Area. The Bay Area Paragliding Club (BAPA) has members from all over the Bay Area and beyond. They meet on the first Wednesday of each month. Meeting times and locations do change, so please check their web site for current information. They manage the Dumps, Stables, and Mt. Tam flying sites. The Marin County Hang Gliding Association (MCHGA) draws members predominately from the North, upper East Bay and San Francisco. The majority of members are hang glider pilots but there several "bi-wingual" and paraglider pilot members as well. They meet on the third Thursday of every month, but the location varies, so check their web page for meeting location. They maintain the Mt. Tam hang gliding site. Wings of Rogollo (WOR) draws most of its membership from the East Bay, southern Peninsula and San Jose area. It has both hang glider and paraglider membership. They meet on the third Tuesday of every month at the Omega Restaurant. Social hour starts at 7:00pm and the meeting starts at 8:00pm. If you want to eat come early because the room usually fills up. They are responsible for the Ed Levin, Mission Ridge and Mt. Diablo (HG permit only) flying sites. Sonoma Wings is a predominately hang gliding club serving Sonoma and Napa counties. They meet on the fourth Thursday of every month at 7:00pm at the Stony Point Round Table Pizza in Santa Rosa. Their sites are Hull Mt., Mt. St. Helena, Elk Mt., Mt. St. John, and Goat Rock State Park. 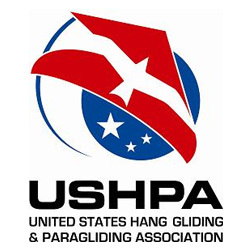 The United States Hang Gliding & Paragliding Association (USHPA) is our national association for both hang gliding and paragliding. It is a nonprofit membership association with 25 elected representatives. It provides us many services such as pilot rating, instructor certification, site insurance, full color magazines. It maintains a membership in the FAI, the international governing body for all forms of private aviation, both powered and nonpowered. This allows us to apply for world records and compete and earn points in international competitions. Perhaps most important of all, it is our liaison with the FAA and is the main reason that no pilot license is required to fly either hang gliders or paragliders in this country (some other countries do actually require government licensing.